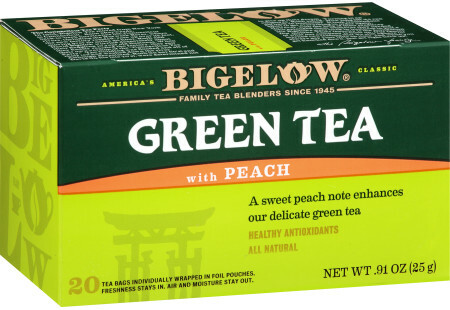 Grill chicken for dinner tonight using Bigelow Green Tea with Peach for a delightful flavor. Instructions for Marinade: In a small saucepan over medium high heat, bring water to the boil and add teabags, reduce heat and simmer for 10 minutes reducing liquid by ¼. Stir in honey and black pepper. Instructions for Grilling Chicken: Preheat grill. Rub chicken with the olive oil and sprinkle lightly with salt and pepper. Place chicken on grill, turn to medium low heat (or use "Indirect" cooking according to grill instructions) and brush with Green Tea with Peach marinade. Cover grill and cook chicken for 15 minutes, brush again with marinade, and cook for another 15 minutes, turn over and brush with marinade and continue cooking for another 20 minutes. Check chicken with a meat thermometer which should read 140-150*F. Remove from heat. Brush peaches with marinade and place cut side down on grill. Grill for 3-4 minutes. Turn, brush with marinade and grill for another 3-4 minutes.